Brinjal? Gotto be a favourite in most households. For a matter of fact, for us Indians? I don't know about you, brinjal is quite favouble in my house. Any which way (Curried Ladies Fingers) and this Brinjal Stir-Fry? A Malaysian Indian style and pretty much an uncomplicated cooking matter. Sliced brinjals stir fried alongside ikan bilis/ anchovies, curry leaves, dried chilli paste, turmeric powder, ginger and garlic. Seriously like? Appetizing right (Kacang Buncis Tempe & Kangkung Belacan)? Oh, for a vegetarian version, do I have to say? Just say no to anchovies. When oil is heated, fry anchovies until crispy, remove and keep aside. In the same oil. saute shallots and ginger. Add chilli paste, stir and cook till oil splits. 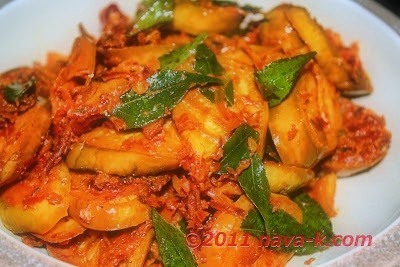 Put in sliced brinjals, turmeric powder and curry leaves. Pour 3 tbsp of water, stir and cook to soften brinjal. Add fried anchovies and lime juice. Wow, never thought of mixing the 2 ingredients... nice! thanks everyone for the yummy comments.